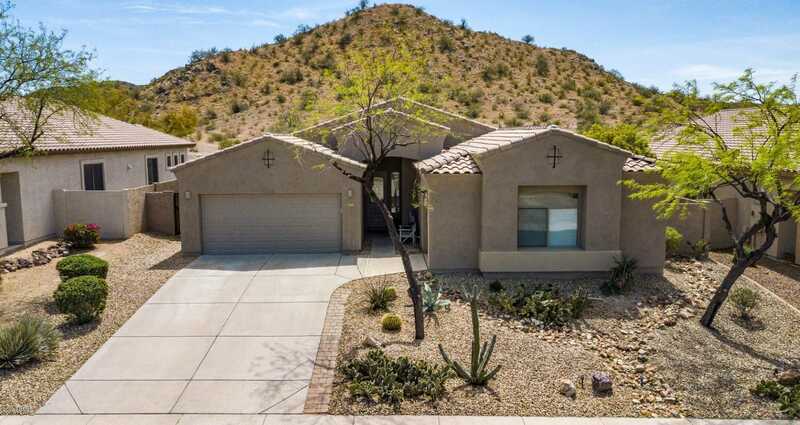 Located in the award winning community of Estrella Mtn Ranch, this home boasts mountain views to be enjoyed from the sparkling pool making all your Arizona living dreams come true! 4 bdrms, 2 full bthrms, formal dinning & living room, den/office, + a family room that shares an open space with the kitchen. The family room offers a fireplace and built-in entertainment center while the kitchen offers corian countertops, tiled backsplash, & recessed lighting. The master is spacious w/ a private exit to the back patio. The ensuite, has a double vanity, seperate tub/shower, and a walk-in closet. New carpet, new blinds, & new pool pump! Close proximity to the elementary school, shopping, dining, clubhouse, water park, hiking trails, lake, and more! Don’t miss out on this desert oasis! Directions: From intersection go west on Elliot Rd, north on 186th Ave, west on Capistrano. home is on the south side of the street. Approximate size: 8160.00 sq. ft. Please, send me more information on this property: MLS# 5907222 – $315,000 – 18637 W Capistrano Avenue, Goodyear, AZ 85338. I would like to schedule a showing appointment for this property: MLS# 5907222 – $315,000 – 18637 W Capistrano Avenue, Goodyear, AZ 85338.